最高のロック・レジェンド、ポール・マッカートニー 5年ぶりのニュー・アルバムの限定2枚組LP! ザ・ビートルズ x 現代的なサウンドともいうべき強力作! 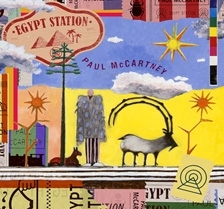 Rolling Stone - 4 stars out of 5 -- "EGYPT STATION, his first in five years, is a deeply eccentric song cycle in the RAM mode, made with pop savant Greg Kurstin." NME (Magazine) - 4 stars out of 5 -- "It's an album of upbeat and winsome notes, and it's simple and honest, as if one of the most famous people in the world has left his diary open for us to read." Clash (Magazine) - "`People Want Peace' is an affectionate ode to the principles The Beatles defined for many in the 60s, with `Dominoes' holding a breezy, late summer evening kind of acoustic charm."